Happy weekend, and thanks for joining us once again! Bloggers, what do you wish to learn about? 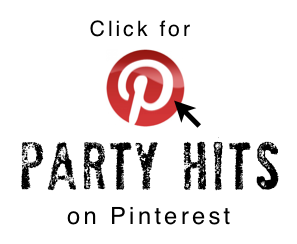 Thank you so much for your participation last weekend, where link party tips were shared. I will never proclaim to know it all, however I think each blogger has little tips and tricks that are used for their own given reasons. Happy to share! There was also some interest in me hosting a few more blogger type of tips posts. So bloggers? Feel free to share what you’d like to learn more about in comments. My fav part on building the link party posts are after all the photos have been selected and loaded. The photos have all been named appropriately for good SEO, and now is the time to share how your projects moved me. I pour a new cup of coffee, take a thoughtful swig, then scroll through your images until the moment that your photo speaks to me, and tells me what I need to say. I could never host a party without sharing this special part. My kiddo finally has a NICE closet… thanks to a cheap kit! “Flowers as big as your head!” Taking you for a tour through two tropical flower places in Maui… oh my. A 10 minute pipe coat hook idea for my son’s room… heres’ hoping it works! My love for pets runs deep. And so does my love for reclaimed wood. 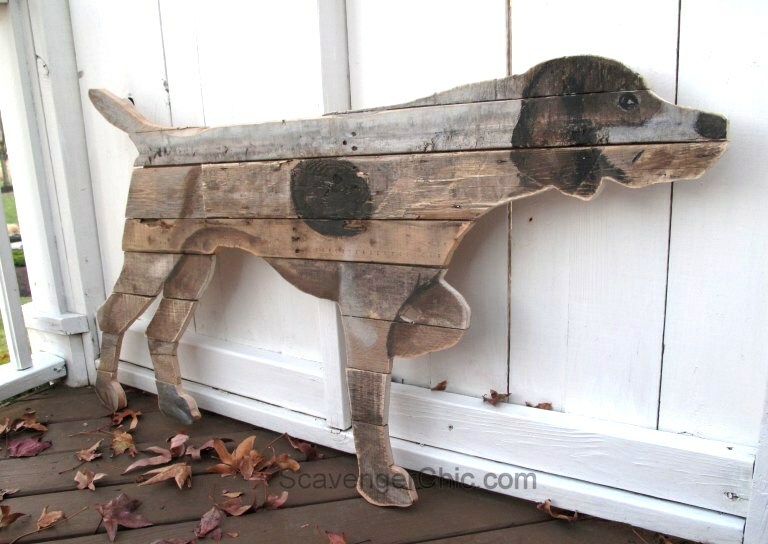 So I was over the top in LOVE with this gorgeous pallet dog wall art. It looks like something you’d see buried behind a huge headboard leaning against the wall in an antiques store. It. Is. PERFECTION! 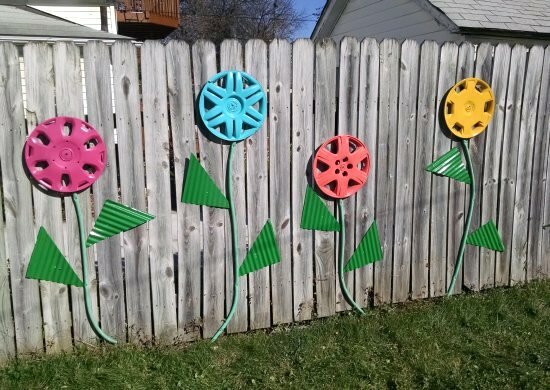 Can you imagine this with hooks, for a kiddo’s bedroom, or fun entry piece? If you were to ask me to build an office from my junk pile stash, this is what I would hope to create. A dash of junk, beauty, and total functionality. I think the most creative office DON’T come from big box stores in a day. They are gathered over time. Don’t you agree? I am completely smitten with this toolbox tote style. The end pieces resemble breadboards. They totally have a repurposed feel! I think I may try this with real ones… how quirky would that be? Beautiful production work by Angie and her hubby. You can either order them, or make them. The blog post tells all. 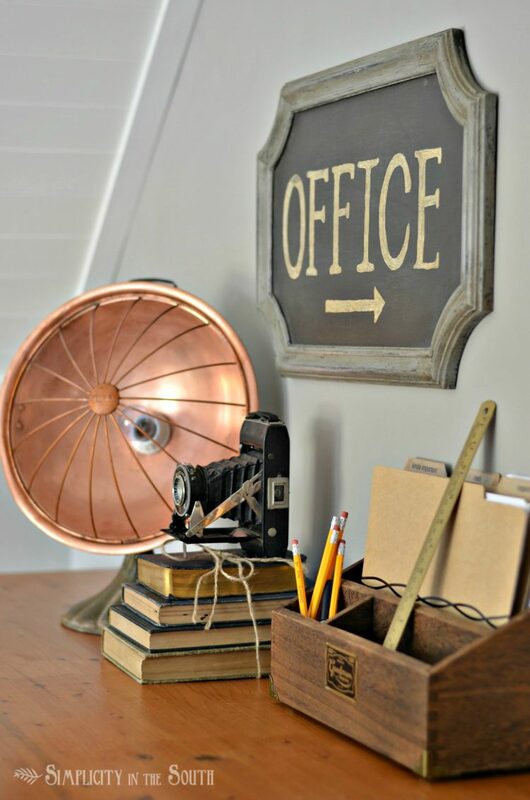 Here’s another gorgeous vintage inspired office, but the star of this show is that desk heater turned lamp. Oh my goodness… you have to see this! 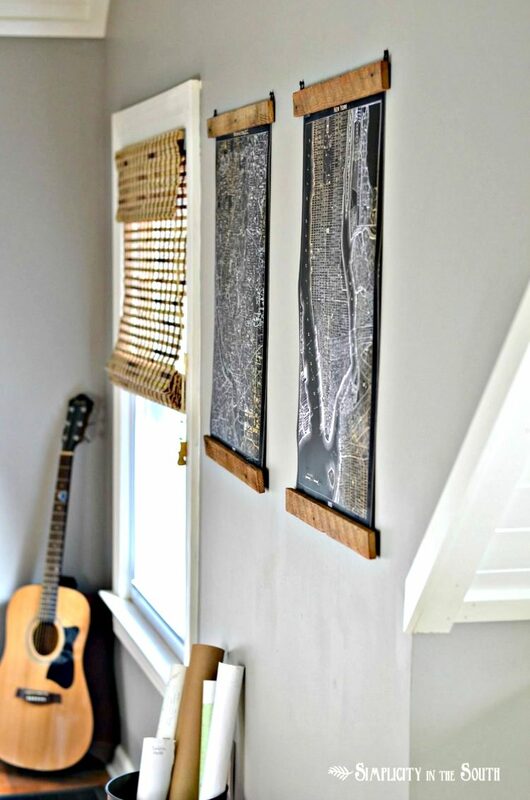 Just when I was wondering how to hang my son’s poster, these wood strips came into the picture. Don’t they look super sharp on those black maps? Wood and black, you will always have my heart! 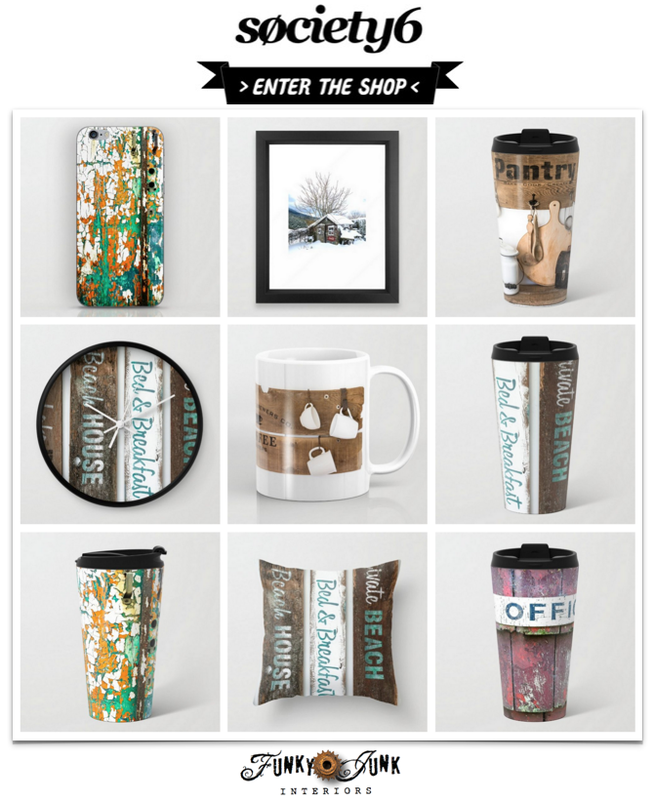 Love the warm, rustic touch they add to something new. Triple yes! A rusty metal mattress spring teamed up with thoughtful art is always a win for me. I love how the spring frames the art, without darkening the room. Perfection. Said as I am currently staring at my upper cabs… this photo could get me into BIIIIG trouble. Super great tutorial included. Eyeing my son’s clothing on his bedroom floor, this super fun way to hang up his clothes came to mind. 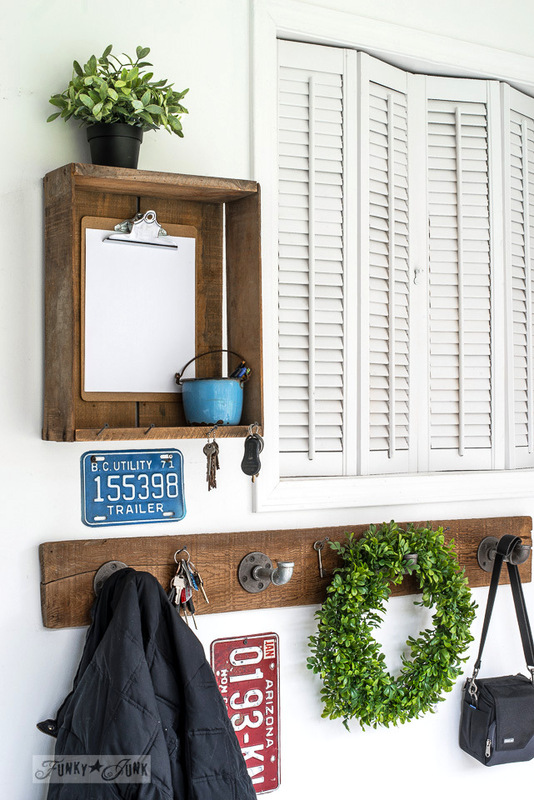 It only takes minutes to make, and offers a super cool, industrial farmhouse charm. Works great for coats! But no idea if it’ll work in the boy’s room yet… still beta testing that one. Here’s the perfect fix for adding colour to your garden without having to plant or water a thing! I am so in love with the vibrant colour choices for those hubcaps! Click through to learn what was used for all the parts. 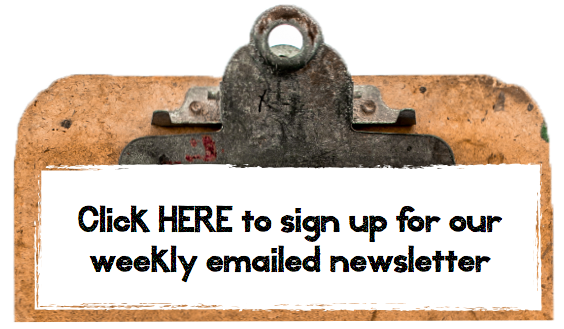 So many great features this week, Donna! I’m loving your pipe hooks and hope your son gets how cool they look. 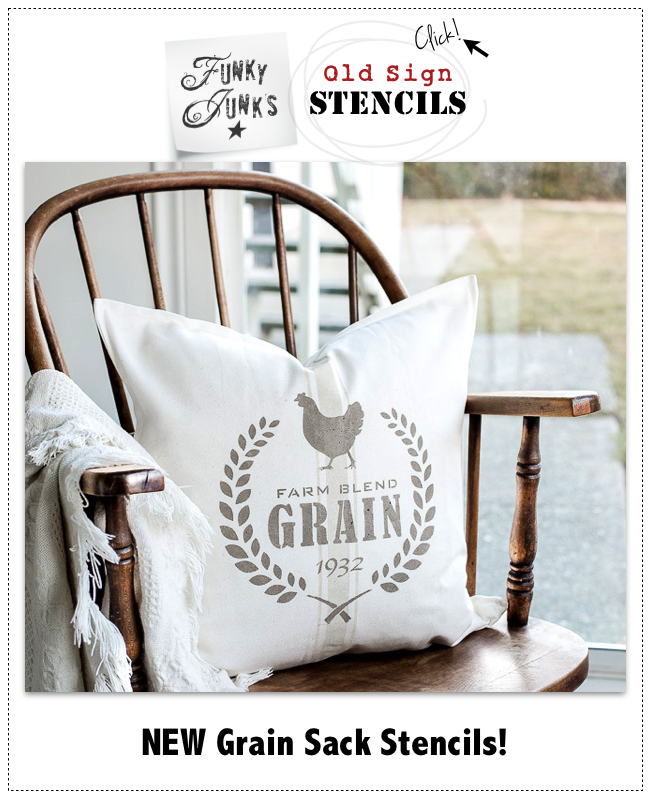 Thanks for featuring my farmhouse totes. 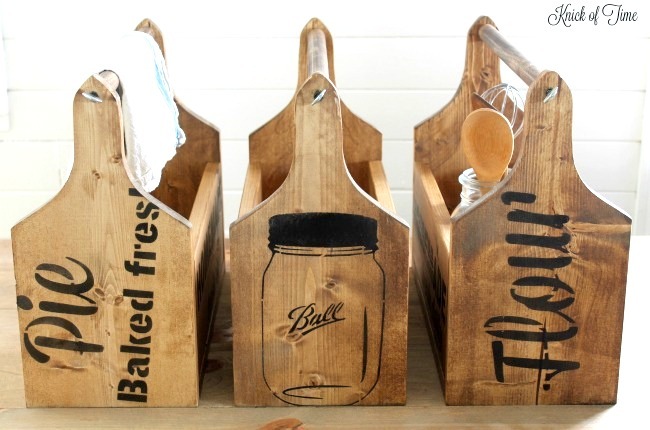 I love Angie’s cutting board totes/paper towel holders stencilled and looking so vintage. Thanks Donna, always, for DIY Salvaged Junk Projects. 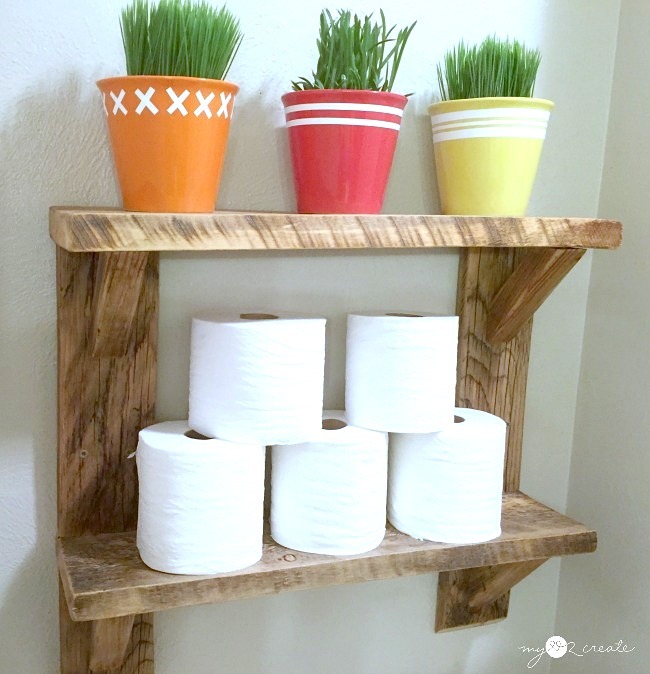 Your pipes and pallet boards = such great ideas, I think I need pipes and joins too. PS just ordered several of your great stencils and have starting bringing my boards and bits of wood into the house to dry out by the time the stencils arrive. 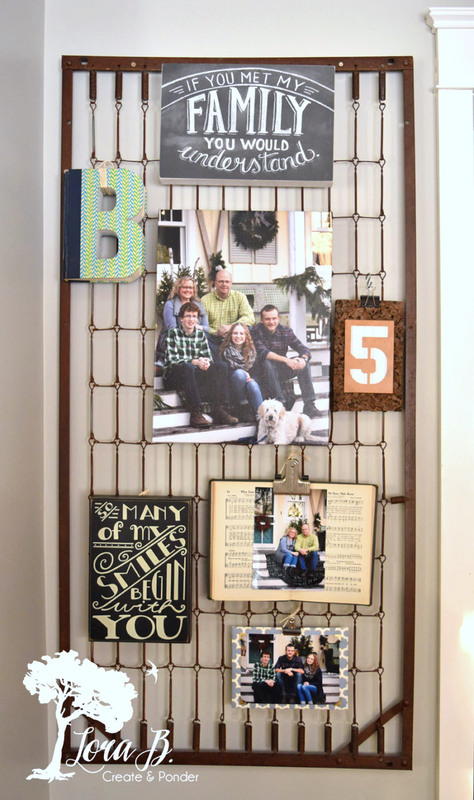 Thanks for featuring my Bedspring Family Photo Wall, Donna! And I have a question…how are you putting the caption and description on the photos so that when I hover over them I can see that info? I’m afraid I’m not labeling my pics properly:( So much technology, so little time. Thanks for hosting! I name my photos with key words while photo editing on the export. I never leave them as img4565 etc. Once uploaded to my blog, and placed into a blog post, I click the photo, click the pen, which opens up a window, then rename them yet again how I wish others to find them on Pinterest when pinned. I enter the same info under alternative text, Image Title Attribute, and Image CSS Class. But for each of your photos, you’d go a little deeper and change things. Just describe exactly what’s going on in each picture. Vision you talking to someone that can’t see. How would you describe that photo? I hope I didn’t lose you. LOL But it’s really important to give each photo a description. I also use something called Yoast, which helps for additional picture info when pinned and SEO, but that only works on wordpress.org and is a whole other topic. Great selections this week! I clicked on 4 and pinned them, and this I almost never do. 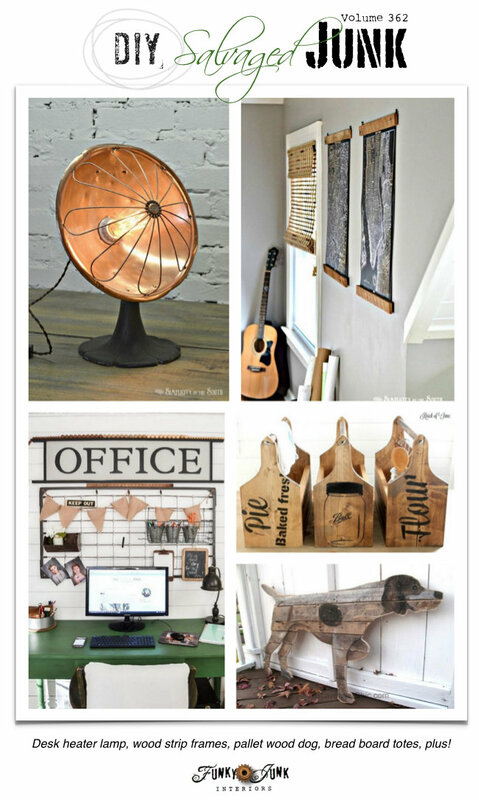 One thing though, the link is incorrect for Vintage inspired office decor with repurposed sign, by My Creative Days. When I clicked on it, it took me to the wood strip hangers by simplicity in the south. So many awesome features, that dog is adorable! Thanks for including my shelf, I hope to see somthing similar in your kitchen soon! 😉 Oh and I love your sons pipe hooks!! Another great week. Love em all. The dog a favorite. Thank you so much for hosting the Salvaged Junk party Donna. As always it’s one for the highlights of my week. 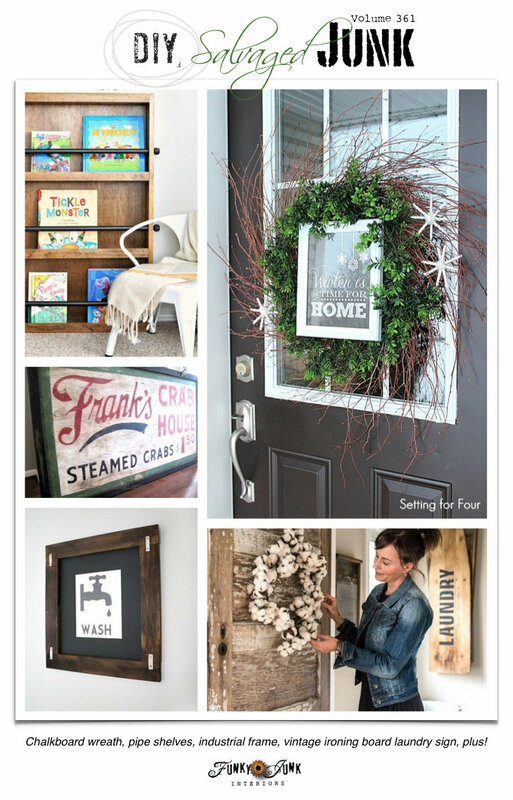 Everyone shares the most beautiful re-purposing projects and it gets the creative juices flowing. Hope you have a wonderful week. always awesome features…I’m a fur baby mama so the dog is pretty cool! I would love one of those wooden toolboxes for my kitchen! 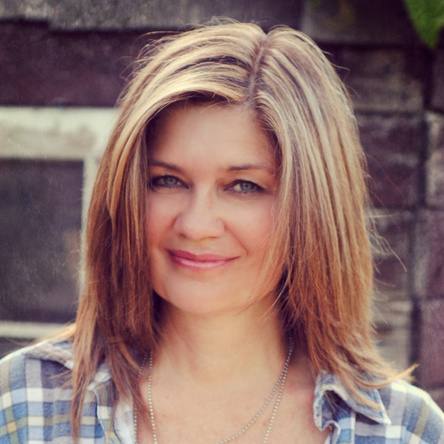 Thank you so much for the features, Donna! Also, thanks for all the useful tips on how to label our photos. I pinning your pipe hooks idea for later. I’m a sucker for anything industrial made with plumbing parts. I love your creative ideas. 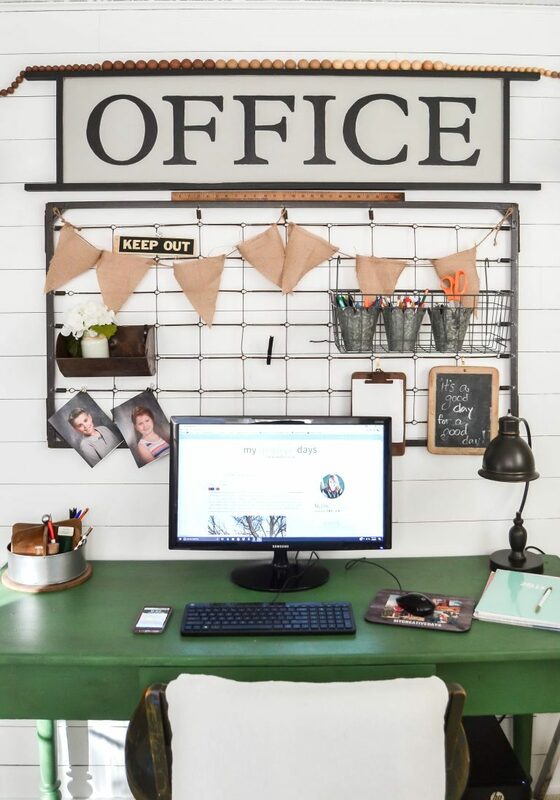 I would love to have a rustic looking office such as this one.